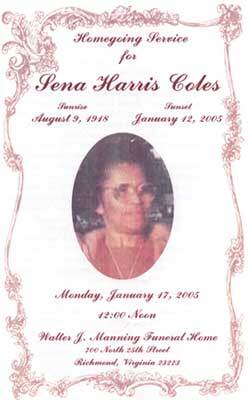 Mrs. Sena Harris Coles was born August 9, 1918, in Powhatan, Virginia, to the late James and Octavia Harris. She passed on January 12, 2005, at the age of 86. Sena accepted Christ as her personal Savior and was baptized at an early age at the Hollywood Baptist Church in Powhatan. She was educated in the Powhatan County Public Schools. Upon graduation, she moved to New York to seek employment. There, she met and married David L. Coles. From this union four children were born. The Coles Family relocated to Asbury Park, New Jersey. Their home was known as the gathering place for family, friends and those in need. Many young people from the south were guided by the Coles for employment in New Jersey. Sena provided care as a foster mother and private duty nurse. She received many awards for her unselfish devotion to children with special needs, among them Monmouth Shore Chapter Smart Set, Wilbur Raye, Brookdale College, and the Division of Youth and Family Services. Sena actively served at the Mt. Pisgah Baptist Church. She was a Deaconess and charter member of the United Fellowship Baptist Church in Asbury Park. Upon retirement, Sena and David returned to Powhatan and attended the Yahweh Assembly Church. Sena enjoyed her home in the country. She remained active until her health declined. Sena’s husband, David, and son D’Elman Coles, preceded her in death. Those left to cherish fond memories are two sons, Harry (devoted daughter-in-law, Bertha), and David; daughter, Alice Dickerson (George); adopted daughter, Ann Marie Morris; two brothers, William and Richard (Alberta) Harris; three sisters, Octavia Lewis, Margaret Manning Burton (Nicholas), and Gladys Morris (Calvin); nine grandchildren; twenty-eight great-grandchildren; three great-great-grandchildren; sister-in-law, Mary Edwards; and a host of relatives and friends. Oh, so happy and bright! The family wishes to express sincere gratitude for every act of kindness, love and thoughtfulness shown during our loved one’s illness and our period of bereavement. A special thanks to caregiver, Martha Banks; the hospice Team; nurse, Leah Cribb; and Randall Mangru, Administrator, Professional Health.